The Himalaya, roof of the world, is a magic place where the magnificence of the world's highest mountains is mirrored in the rugged beauty and unique culture of the people who live in their shadow. Take a ride to these himalayan destination. Drive along ancient pilgrim trails, visit the remote Himalayan temples and shrines and experience the serenity and tranquillity of the Himalayas. 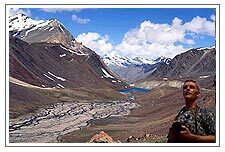 Travel on the same trail used by pilgrims for centuries to visit sacred pilgrimage site such as Kailash Mansarovar, the Holy Mountain in Tibet and the Char Dhams Kedarnath, Badrinath, Yamunotri, and Gangotri. In the Trans-Himalayan regions the Monasteries, often built on steep slopes, still dominate social life and religious practices that continues in much the same way.